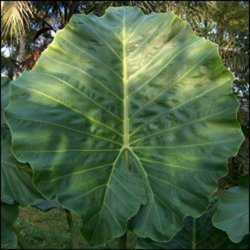 Many lovers of tropical plants are smitten with the very large leaved Alocasia species, and many of them lust after a plant as large as Alocasia robusta is reputed to grow. 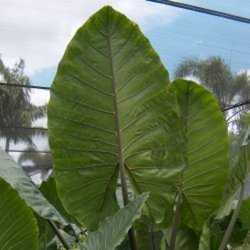 One result I have been seeking in my breeding work, a holy grail of sorts, is a giant-leaved Alocasia that is easy to grow for all. Here I'll share about what I've come up with so far . . . In a previous article on Alocasia robusta, I mentioned that I had succeeded in producing hybrids between the hardy Alocasia odora and the very finicky Alocasia robusta. I gave the name, Alocasia x robudora to the group of seedlings I obtained from the cross. 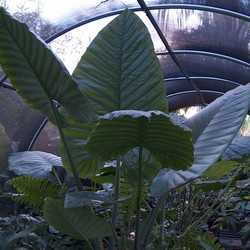 That was in early February 2008, and since then I have grown the little seedlings up to size. A few have matured to rather ponderous dimensions, and so I can now report that I have, not just one or two, but at least a dozen candidates for the title of super-sized Alocasia. So far, almost all of them are as easy to grow as A. odora. In addition, these plants produce what could be the most spectacularly colored inflorescences of any Alocasia I have grown. 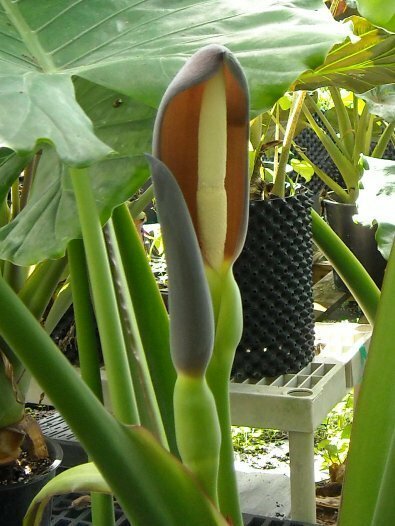 With blooms ranging in color from dark purple to a lighter purple outside and bright pink inside, and up to six inches long, they may represent the potential for these plants becoming the first Alocasia to be grown for the blooms as well as the leaves (see photo below, left). Even while the little seedlings were just beginning to grow, my large A. robusta, the one that was flattened by last winter's cold snap (see thumbnail photo above, right), went on to produce a cluster of blooms in Spring before an untimely demise. Through the fog of pollen dust, I produced a second wave of A. robusta hybrids, this time using an Alocasia x calidora F2 selection with unusual bullate or puckered leaves as the ovule parent. The seedlings from that cross are now large enough that I know for a certainty that they are indeed hybrid progeny and not a disappointing A. odora selfing. How much Mo' will they Gro'? Since this is the first full year I've been growing these plants, I've yet to see the maximum size they will be able to attain. I do know that when I've succeeded in blooming a Robusta, the plant was not as large as some of these have been when they first bloomed. The ultimate size of a Robusta is legendary, so if the size my seedlings have already attained is any indication, I should have some giants to show for my work. Meanwhile, the work continues because, as anyone who hybridizes knows, the most diversity comes in the F2 generation, not the F1. If you can imagine it, even larger plants could result if a successful F2 generation is produced from these F1 plants. That's one reason why these plants are not ready for release; they are a work in progress. Meanwhile, I can't just sit on my pollen brushes, especially when at least two of my Robudoras are producing pollen! So I've gone and crossed the Robudora with the Imperial Giant. If successful, this cross will result in a rare and complex 4 way hybrid, the parents of which are all large to huge growers (A. macrorrhizos 'Borneo Giant', A. 'VangiGo., A. odora, and A. robusta). So far, it looks like I might end up with just a few seeds, but even one viable seed from such a cross would be remarkable. My hope is that next year I'll be writing about, and showing pictures of, the next generation of truly huge and hardy Alocasia hybrids. Oh, did I mention that one of my huge Alocasia x portora plants has thrown a pile of pollen? Any suggestions on what I should do?